Don Melchor Chilean wines…something to write home about! Do yourself a favor. Go here: http://www.wine-searcher.com/find/don+melchor/1993 and order this wine immediately because it may be the last one and you don’t want to miss it. Seriously. Only 15,000 cases of the world-class Don Melchor Cabernet Sauvignon 1993 were made and 2% of that was saved for the Concho y Toro library at the winery. Don’t pay attention to the 87 points on the Wine Searcher site…it’s drinking beautifully. If you missed it, don’t worry, there are other top flight Don Melchor Concha Y Toro wines for you to scoop up. We tasted four Don Melchor Cabernets: 1993, 1986, 2006 and 2009, all from the same Puente Alto vineyard at the foot of the Andes. The 1993 and 1986 were fabulous old-style, medium bodied 100% Cabs with the ’93 taking the prize. Aging superbly like a fine wine should! The 2006 and 2009 were both 96% Cabernet Sauvignon and 4% Cabernet Franc. The newer wines fruitier and more contemporary and also very good. There are 120 parcels in the Puente Alto vineyard having been divided over time to develop each parcel independently to produce the best grapes that eventually make it into the wines. Winemaker, Enrique Tirado, tastes every single parcel’s output…that’s a lot of grapes!…and ends up using only 6 -7 parcels. The variety of parcels provides the complexity that you taste in the wines and you can taste it in every sip. Thank you, Enrique, for tasting through all of them! Don Melchor Concha y Toro wines highly recommended! 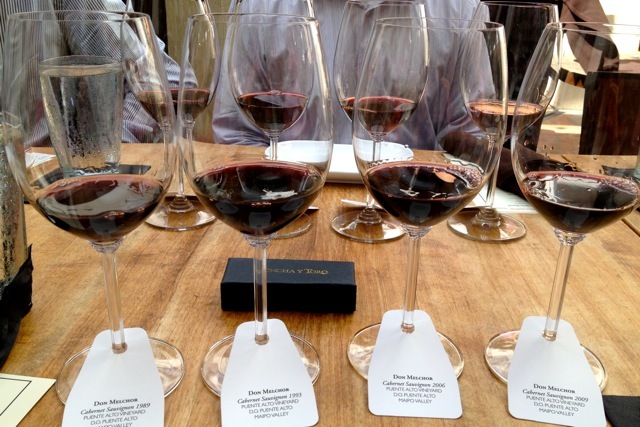 Don Melchor Chilean wines…something to write home about! http://t.co/4HDSeb0373 via @sharethis.